Conditional Notifications is a premium add-on for Better Notifications for WordPress. You can purchase it here. 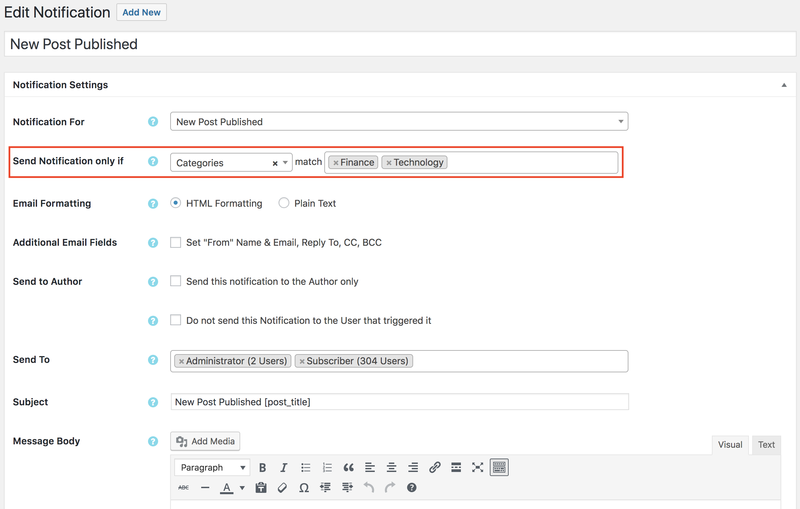 The Better Notifications for WordPress Conditional Notifications Add-on allows you to limit certain notifications depending on which categories, tags, post formats, or terms you choose. You can select single or multiple categories, tags, post formats, or terms but not mixtures of them. Programatically speaking, it uses an OR logical operator to send notifications. E.g. Send if this post is in the Finance category OR the Technology category. It also works great with the Custom Fields add-on. It also allows you to set-up customised ‘User Role Changed – For Admin’ and ‘User Role Changed – For User’ notifications when users move between two roles that you specify. E.g. You can set-up a notification when a user moves from the ‘Subscriber’ to ‘Member’ user role and make it different to the notification you use when a user moves from ‘Member’ to ‘Pro Member’. Additionally, if you want to send ‘New User Registration – For User’ notifications to just users that register (or are registered) for a specific user role, you can also do this. This add-on should work with any custom post type that is set to ‘public’ (so that it shows in the list of notifications) either created in code, or via another plugin (such as Custom Post Type UI), providing it is created using WordPress standards. Plugins that utilise custom post types to store their data may work however, this cannot be guaranteed due to the number of plugins available in the WordPress.org Plugin repo. If your Category, Tag, Post Format, or Taxonomy doesn’t show in the list, or, when selected, doesn’t allow you to choose a single category, tag, post format, or term, then you may need to ensure that you have already created one and assigned a post to it in order for it to show in the list. This isn’t always necessary but might help if you run into this issue.